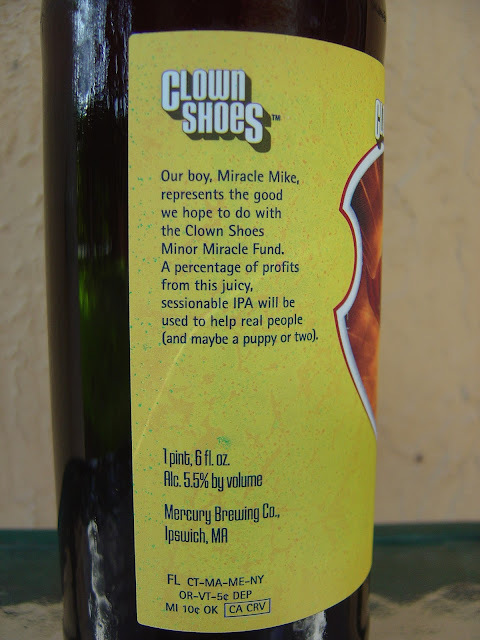 Today I'm drinking Clown Shoes Miracle India Pale Ale brewed by Mercury Brewing Company in Ipswich, Massachusetts. 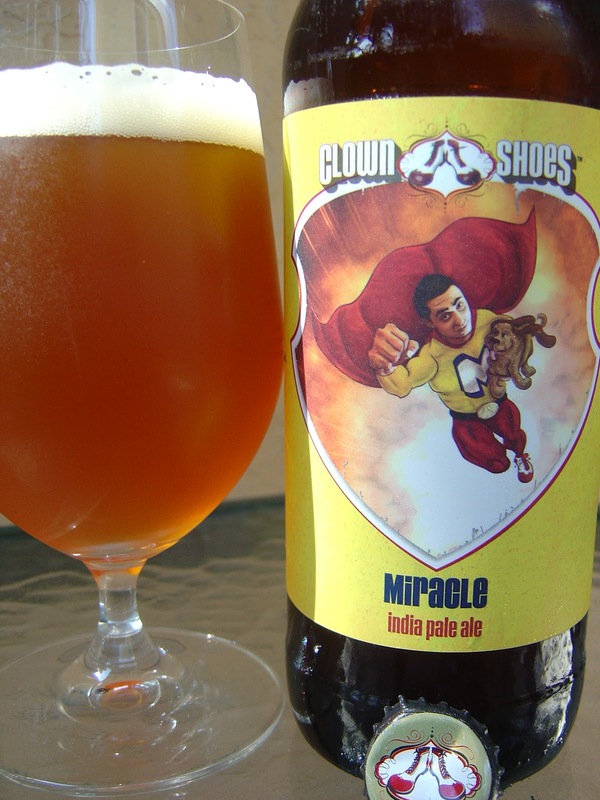 The label depicts Miracle Mike, a Superman-like caped hero flying through the air with a rescued puppy under his arm. Yes, you can barely see them behind his ultra-ripped thigh and calf muscles, but he is wearing clown shoes. The story on the side builds on this theme, letting you know Miracle Mike represents the Clown Shoes Minor Miracle Fund. Some of the money made from this beer helps support its mission. Bottled 5/2012. Very welcoming aroma: nice tropical peach and tangerines over a doughy base and accompanied by some hoppy spicy interest. Hoppy pine and citrus flavors, about an equal dose of each, get things going here with Big 22. The resinous pine meets some zesty citrus and sweet orange, all complementing each other perfectly. The flavors are a little less tropical than I anticipated after taking my share of sniffs, but that's just an observation, not a knock. Though the initial flavors were bitter, they never went too far. Some malty sweetness also comes to add some balance. There are little spicy black pepper jabs throughout, like little nudges on your palate. Quite juicy. Flavorful, enjoyable. The 5.5% alcohol wasn't really noticeable though the finish was a bit dry. For sure, check it out!